I'm selling my ragged old pickup truck on Craigslist. I'm asking $475, to give an idea of how ragged. So far I've been offered a pool table or a Rottweiler puppy in trade. Yesterday afternoon, I stopped by Trader Joe's after work--Primarily to pick up their house-brand Cheerios, better than the original. Packed, and full of whining, undisciplined children. Parents negotiating with children--"If you start behaving, I'll buy you candy" "no, I want TWO CANDY!! !TWO CANDY!! !TWO CANDY!!!" "OK, quit screaming and I'll buy two candy" "Don't bump the cart into that man again....Didn't you hear me, I said don't bump the cart into that man again...One....Two..."
And they were out of Joe's O's. I put the rest of my stuff back and left. 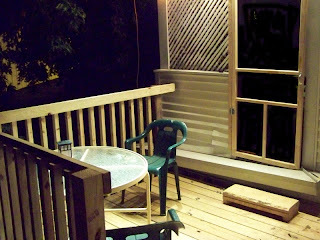 95% finished with my new deck--Need to add a bit of bracing to the posts, and balusters for the stairs, but it is usable now. I was thinking that I wish I'd just done the stairs and skipped the deck. 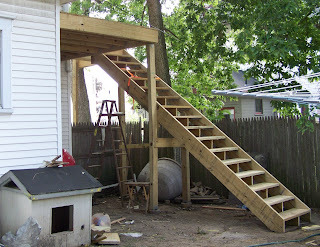 On further reflection, the deck itself wasn't much problem, almost all of my trouble was stairs. Next time I'll do open stringers if there's any budget constraints--The brackets I used are easy and sturdy, but expensive--The screws alone for just the brackets were $100. I found some 12 volt track lights I'd bought on clearance years ago. This lets me mount the transformer inside the existing porch well out of the rain--The only thing outside is the 12 volt lights, same voltage as garden lights. Just the track lights, no flash. And the temporary screen door--This will eventually get replaced with a real door, when I get the time and cash to enclose that porch. 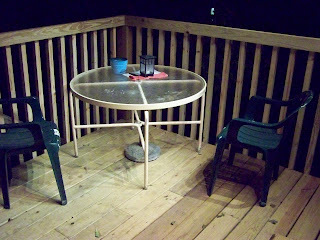 It is the floor to the old porch that's crooked, not the door--the floor is actually a slightly pitched metal roof. Finished up the stairs for the deck today. The bottom section is fairly easily removable so I can pour a pad under it. I'm glad I did it that way, because it needs to be about 2 feet closer to the house than I'd calculated. Got the hard part of the stairs done. I'm doing them in two pieces, since even 16 foot 2x12 isn't quite long enough. The upper halves needed just over 8 foot pieces, but because of the angles I was able to cut them both from a single 16 foot. I'm going to build the bottom half as a removable piece before I pour a pad. I've got the open stringer done, but really needed the top and bottom stairs in place before I could line it up. The biggest problem I have is finding common reference points to measure from. 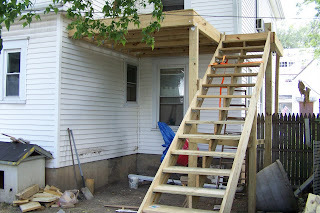 I used the open stringer to mark the closed stringers before I put them up, but I miscalculated something--Apparently I didn't account for the height of the decking, so the stop step was going to be an inch shorter than the rest. I wound up installing the top step where it really belongs, then using the open stringer to mark the bottom step of this set--That way the open stringer will fit, and I can use it to lay out the rest of the steps. My son came to help a bit--While I was trying to figure out what I was going to do next, he was horsing around with the footer hole I'd started and abandoned when I hit what appeared to be a solid layer of brick. He got past the bricks where I'd stopped, and it looks like it is just dirt the rest of the way down--I'd expected the same sort of rock piles I'd found in a couple of the other footers. That will let me move the corner post of the landing to where I wanted it in the first place, greatly simplifying the required bracing. These stairs are as narrow and steep as code allows. They are wider and not as steep as the main stairs to the upper apartment.